The material is soft, and durable. It has elastic band that make the cover fit well It's well designed and is an excellent choice for swivel chair protection. Package included: Chair Cover*1(Chairs not included). Note: Different Chair Style: Before you purchase, please measure the dining chairs. Then check the measurements stated of chair cover to see if our slipcovers will work for your chairs. Office Chair Cover: Protect office chairs from dirt and scratches of pets, fits most office chairs. Please remeasure your chair size before your purchase. Reference Size: Chair back's height: 27.5-31.5 inches, Chair back's width: 17.7-22.8 inches, Chair seat length: 17.7-22.8 inches, Chair seat width: 17.7-23.6 inches.Please refer to the picture 3. Sturdy Chair Slipcover Protector: The desk chair cover is well-designed, nice stretchy/conforming fabric has a nice texture, quality zippers make this cover fit your chairs perfectly. Stretchy Material to Fit Chairs Well: The material stretches and recovers quickly, secure fit with sewn-in elastic hem. 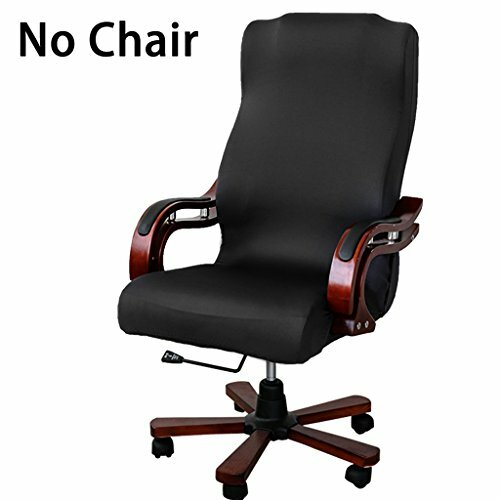 Fits most universal type office chair. Cosmtic Function: It will make your flaky but still reliable chair new again. Easy to put on and off in flash, it is a great chair cover to protect or update your leather office chairs. View More In Chairs & Sofas. If you have any questions about this product by BTSKY, contact us by completing and submitting the form below. If you are looking for a specif part number, please include it with your message.